The great British tradition of huffing, tutting and whinging is in grave peril. 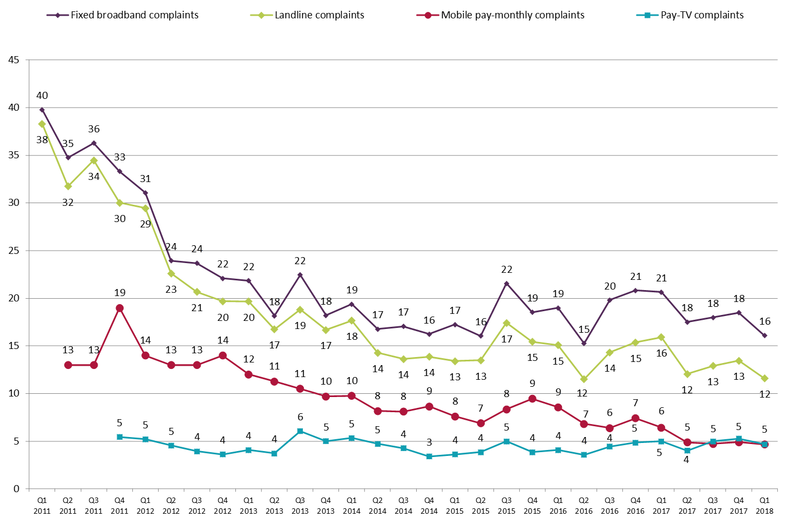 Regulator Ofcom has reported a decline in complaints across telecoms, mobile and TV services. TalkTalk and BT are the most moaned-about home broadband operators, with 29 and 23 complaints per 100,000 subscribers, respectively. Plusnet received 20, above the industry average. Performing better than average were EE with 13, Virgin with 12, and Sky with 5 per 100,000. Contract mobile customers of Virgin (11 per 100,000), iD (10) and Vodafone whinged the most, while Tesco had the fewest. Remarkably, the overall level of complaints declined. Paul Carter of wireless network benchmarker GWS recently noted that satisfaction with mobile operators is steadily rising. The industry average in UK mobile is 81 per cent satisfaction, partly, he believed, because voice over Wi-Fi is helping to fill in some of the notspots. "If Donald Trump had an 81 per cent approval rating, he'd be doing backflips," he noted.